At La Mama December 12, 2016 Dario D'Ambrosi explained "The Integrated Theatre of Emotion," a university-level program for mentally disabled people that has been established by Italian actor/director Dario D'Ambrosi. Photo by Jonathan Slaff. Dario D'Ambrosi, founder of Teatro Patologico, and Mis Yoo, Artistic Director of La Mama, welcomed the audience December 12, 2016 at "An Italian Miracle," an evening of a performance, panel discussion and film screening, to introduce New York to "The Integrated Theatre of Emotion," a university-level program for mentally disabled people that has been established Mr. D'Ambrosi. Photo by Jonathan Slaff. 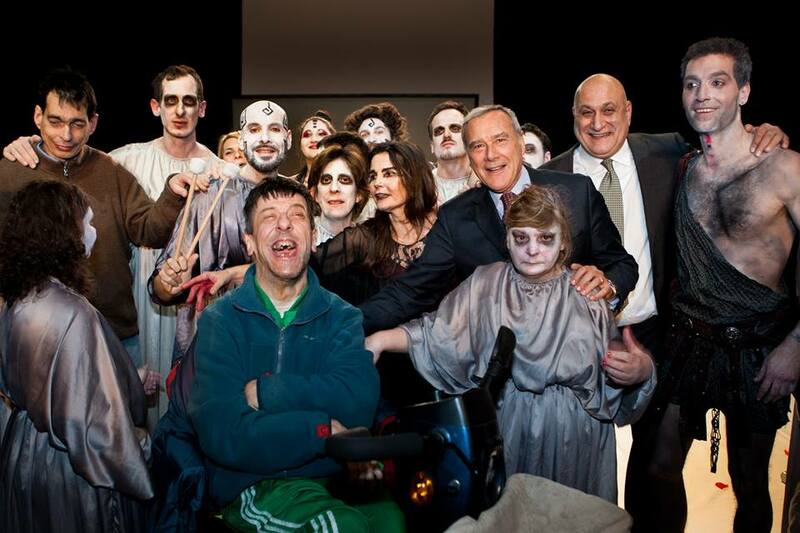 Teatro Patologico acting company with Pietro Grasso, President of the Senate of Italy. Photo courtesy of Teatro Patologico. Last night was the one-night event at La MaMa, "An Italian Miracle" an evening in which highlighted theater and film works of Dario D'Ambrosi, along with a film and discussion about "The Integrated Theatre of Emotion," the Italian university curriculum in theater arts for the mentally disabled, which D'Ambrosi and associates have created in Rome. D'Ambrosi is founder of the theatrical movement named Pathological Theater (Teatro Patologico). "The Integrated Theatre of Emotion" is a university program that academically and professionally prepares people for careers in theater arts who are schizophrenic, catatonic, manic depressive, autistic or born with Down Syndrome. "The Integrated Theatre of Emotion" has been fully operational for almost a year now at the University of Rome Tor Vergata, in one of Rome's outer boroughs, and has been revolutionary in the lives of people with mental disabilities and their families. The La MaMa evening will feature video clips, exclusive testimonials and presentations of results of scientific studies that demonstrate the accomplishments of the program, presenting it as a model that could be used worldwide to help give back to many marginalized people their deserved dignity. Excerpts from play, "The Buzzing of the Flies" by Dario D'Ambrosi, performed by Greta Scacchi and Giorgio Colangeli. In a world without madness, a team of scientists and psychiatrists is working on a new ambitious project: to bring back folly to the earth, in order to fight boredom and depression. They capture the last three crazy people in the world: a failed painter, an absent minded dreamer and a sweet and sensitive piano player. First, the scientists observe the three for a while; then, with a surreal theatrical staging that is a form of therapy, they bring them back to their original day to day life, where their madness probably started. This "medically approved performance" is directed by this chief psychiatrist and features a group of professional actors and one of the facility's other psychiatrists, Dr. Natalia. When the three fools finally discover the true reason behind the experiment, they want to commit suicide. Dr. Natalia is the only one moved to compassion for them and becomes their accomplice. As we later find out, she suffers from the same disease of the three protagonists, a form of madness that she kept concealed. She convinces them to give up suicide and run away from the institute. Together they will restore joy and lightheartedness in this world without madness. Presentation of the "Integrated Theatre of Emotion" university course and screening of the documentary, "AnItalian Miracle." The first ever university-level degree in "Integrated Theater of the Emotion" was born in Rome in 2016 thanks to the communal effort of Pathological Theater, the University of Rome Tor Vergata and MIUR (the ItalianMinistry of University and Research). Its objective is to increase and sustain education for those with mental or physical disabilities. The curriculum includes a compendium of theater-related courses: acting, playwriting, directing, set design, costume design, music therapy, singing and dance. Through these studies, disabled students acquire tools to help them approach the professional world and recover an often denied dignity. Thanks to the success of this course, the "Integrated Theater of the Emotion" will also open at the University of Camerino in central Italy in 2017. "An Italian Miracle" is a film that documents the work of professors and disabled students of the very first university-level degree in "Integrated Theatre of Emotion." The documentary shows excerpts from the lessons given at the Pathological Theater. It illustrates techniques of theater therapy that are employed and also transmits the atmosphere and the energy of Dario D'Ambrosi's lifetime of work. Panel Discussion of the scientific results with: Laura Coccia (member of Italian Parliament), Prof. Giuseppe Novelli (Dean of the University of Rome "Tor Vergata") and Francesco Serra Di Cassano (journalist and writer). Screening of film, "L'Uomo Gallo – Days of Antonio" by Dario D'Ambrosi with Celeste Moratti, Luca Lionello and Dario D'Ambrosi. In the 1920s, in a poor rural province outside Milan, a mentally handicapped boy with one leg shorter than the other was forced to grow up in a chicken coop, where he emulated the chickens and considered himself a rooster. Ultimately he was taken to a psychiatric hospital, where he struggled to build a human life. The film reveals his long and difficult ordeal at the institution, where he encountered a strange and desperate universe of characters, most of them funny and marginalized but with an abundance of humanity. In particular, the film spotlights his intense friendship with his room mate, who was manic about order and cleanliness. The two form a special relationship born of silence and small gestures of solidarity. Celeste Moratti plays Antonio. Director of Photography is Andrea Locatelli. Art director is Francesco Frigeri, Winner of the David di Donatello in 1999 for "The Legend of the Pianist on the Ocean." Costume Designer is Maurizio Millenotti, Oscar-nominated twice for the films "Othello" (1986) and "Hamlet" (1990), both directed by Franco Zeffirelli. Make-up is by Manlio Rocchetti, Oscar winner in 1989 for "Driving Miss Daisy."